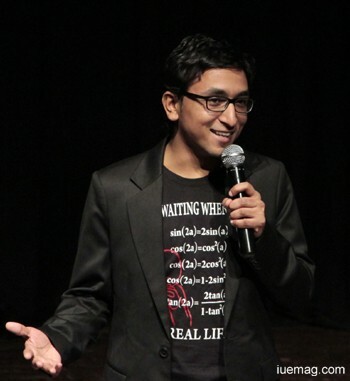 "The first experience of being on stage, sharing jokes with your audience and getting their applause is the best thing for me and still I'm performing for that best thing," says an engineer turned stand-up comedian Mr. Appurv Gupta. At a mere age of 19, Appurv started with public speaking. Initially, he started with storytelling and motivational speeches but soon, he realized that his speeches not only motivated people but also made them laugh to an extent, which for him was the best part, and this idea of being a Stand-up Comedian ignited. "I actually wanted to do public speaking as from the beginning it was my cup of tea and I was fully confident about it, but when I was 21, I realized that in Public speaking, Stand-up Comedy is my passion," says Appurv. As an engineer he always thinks with logic and tries to find the reason behind everything and this surely helps him while writing jokes. "While trying to write jokes and punch lines I start with logic and reasoning, and the outcome is always wonderful. So, Engineer mind always plays an important role behind the stage and comic mind plays an important role on stage," he narrates. On asking him about his comedy and tragic life situation of pursuing engineering and ending up with comedy he laughs and says, "I believe that if you want to do anything in your life, always do some professional courses because professional courses will teach and direct you to the paths you actually want to take up in life. Along with this, it also opens minds, and as an artist you start thinking logically." He feels its destiny's role that made him an engineer first and then a stand-up comedian so that he could understand comedy through his engineering mind. Appurv says, "I always learnt more from my bad shows than the good ones. Bad shows always teach what I shouldn't do in my shows which is very important for an artist and sometimes it's kind of fun also that I am giving my best shot but still no one is laughing. I have had some really bad shows in the beginning. So, now I avoid repeating the mistakes that made the shows come out to bad and that helps me end up with good shows." He has firm belief on 5C - Clean Comedy for Corporates, Colleges and Cafes. He experienced that it's easy to make people laugh if the jokes are below the belt. "The challenge is to make someone laugh while they are enjoying the show with their family and simultaneously no one is feeling embarrassed. So, I started doing clean comedy and I always try that everyone can enjoy my show with their family," says Appurv, a young and rising comedian. "I am still not sure why I am doing comedy but I still focus on my job to make my audience laugh. I have always wanted to share something on stage and humour is the best way to impart any message. So, I believe that may be sharing messages and sharing my point of view with the audience is still helping me to continue with stand-up comedy. I believe that if we focus on our job and what we can do to the best, everything comes to us naturally," were his inspiring words. He also thinks that live stand-up comedy is new in this country and, still majority of the people don't know about this art. So if we start showing them that it's all about curse words and double meaning jokes, then I think we are setting a wrong picture in front of them. In my opinion, we should always start with clean comedy. If the situation and script demand, only then we should continue with different dimensions which can go to below the belt too. Appurv says, "After every live show I feel that this show is memorable for me. Audience reactions always make me happy and their laughs always make my day." He also adds, "Recently in my solo show I was doing my performance and then someone from the audience asked me to do a particular bit and when I started doing that particular bit, to my surprise, the audiences started sharing the punch line along with me. I had seen these kinds of things in music concert only where someone from audience requests some songs and they sing along with the artist." It gives him a feeling of gratefulness and he feels blessed and lucky to have got the chance to share the stage with famous and big names of India and also that his jokes make people happy every time, and sometimes, they do remember his jokes by heart too. "That's quite surprising to me," he laughs.